TOPEKA, Kan. (AP) — The Democrat running to replace Kris Kobach as Kansas secretary of state is trying to get voters to repudiate the conservative Republican’s political legacy of tough voter identification laws, which Kobach often touts while campaigning for governor. Brian McClendon, a former Google and Uber executive, would break with Kobach’s policies if elected secretary of state and move Kansas toward allowing voters to register on election day. Kobach derides that as a recipe for election fraud. At least a little change is in store. While GOP nominee and state Rep. Scott Schwab is a conservative who backed the voter ID policies Kobach championed, he is promising to be in the spotlight less. And unlike Kobach, neither is an attorney and both said they’d turn over election fraud cases to local prosecutors or the attorney general. Kobach had fought for the authority to pursue them himself. 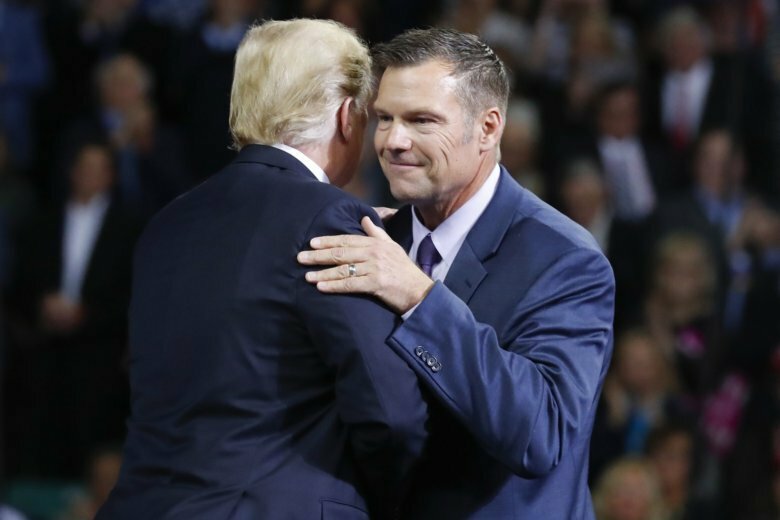 Known already as an immigration hardliner, Kobach expanded his national profile in the secretary of state’s office and served as vice chairman of President Trump’s now-disbanded commission on election fraud . Kobach has said repeatedly that he is proud Kansas has some of the nation’s toughest voter ID laws. But the race to replace high-profile Kobach as the state’s top elections official is relatively quiet and bereft of television ads. In GOP-leaning Kansas, Republicans generally are the front-runners in down-ballot statewide contests, and a Democrat hasn’t won a secretary of state’s race in 70 years. Schwab, from the Kansas City suburb of Olathe, is better known than most legislators because his 10-year-old son, Caleb, died in August 2016 while riding a giant waterslide at the Schlitterbahn park in Kansas City, Kansas. Schwab said his model for the secretary of state’s office is its GOP-run 1950s and 1960s version — efficient but low-key. “I’m a little tired of the public-eye side of things and the overly visible side of things for me, personally,” he said during an interview. McClendon has the resources for a competitive race. He started by putting $150,000 into his campaign and raised another $359,000 in cash contributions through late July. Schwab raised less than a third of that through late July and has made two $25,000 loans to his campaign. McClendon stresses his business and technology background. He’s a native of Lawrence, home to the University of Kansas and the state’s most liberal enclave. He returned there last year to become a research professor and advise startup companies. To demonstrate that he’s serious about promoting voter registration, he has launched a website to allow people to register to vote online or with their cellphones. Kobach pushed the Republican-controlled Legislature to pass a law requiring new voters to submit papers documenting their U.S. citizenship when registering, starting in 2013. Lawmakers in 2015 granted the secretary of state’s office authority — sought by Kobach — to prosecute election fraud. His office has filed 15 criminal cases, most of them involving a voter casting ballots in two states at once. “Kris Kobach has been a very political, very partisan, very activist secretary of state,” Miller said. No state had been as aggressive as Kansas in enforcing a proof-of-citizenship requirement until a federal judge struck down the policy in June as an unconstitutional violation of voting rights. The judge found that between 2013 and 2016, one in seven new voter registrations — about 35,000 — were blocked for lack of citizenship documents. The state has appealed the proof-of-citizenship ruling, which Kobach called “extreme.” McClendon said he would drop the appeal and ask legislators to strike the proof-of-citizenship requirement from Kansas law. Schwab said opposes having the state drop its appeal because it needs the courts to determine how far the state can go in making sure people who registered are qualified to vote.